Meet Krishna Das, whose music evokes devotion. 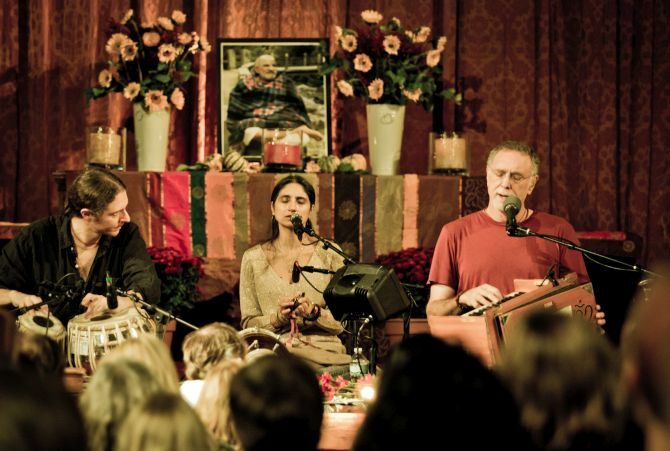 Bringing the traditional call-and-response chanting on to the global stage, Krishna Das, or KD as he is popularly known, has given kirtans a new twist. Playing up the Indian verses with his American roots and modern instrumentation, KD says chanting just cuts through everything. Witnessing many hardships, KD followed his journey to India through the '60s and '70s till he finally found his guru Neem Karoli Baba. Today, he is a renowned spiritual teacher and a Grammy nominee chant master. KD, who is currently on an India chant tour, spoke to Meghana Biwalkar for Rediff.com. Earlier, your visits were not pan-India, but restricted to one or two places. Now, you are conducting kirtan tours across the country. When did you realise that India was ready for your style of kirtans? I have been receiving emails and Facebook posts from people in India for a long time. It became apparent that there was a very strong desire for me to share the kirtan in India. I resisted for a while, being a little shy about my "angrezi style" chanting. But, then, I realised that because of the Internet everyone already knew what I do...and they still seemed to be open to me coming here and chanting. Last year was the first "public" kirtan in Mumbai. I have been singing in India, but only in the temples, or for sadhus in the jungle. So, I was completely blown away when 2,000 people showed up to chant with me. Your music reaches out to people across age groups. What would you say is your ‘magic’ chord? Honestly, it is the blessings and grace of my guru, Neem Karoli Baba. I just sing what I sing in order to connect with him. The "audience" is part of the process and we all get a chance to move towards the love within us. In your unique way, you have given kirtans a new avatar. What is your take on this confluence of cultures? The world has shrunk and now everyone is in touch with everyone around the globe. We have truly become one family. It is still a very dysfunctional family, but I think there is hope for us. KD's Live Ananda was nominated for the 2013 Grammy Award for the best new age Album. He performed at the Grammy Awards ceremony as well. How would you describe your journey into Indian devotional music? I love Indian music. It is the most beautiful music in the world. But that is not what I do. I'm a kid from Long Island who grew up with rock and roll. What I do is kirtan; chanting the names of God. The important thing in kirtan is one's intention, not the musical form. In one of your interviews, you had said, “Suffering is a requirement to wake up spiritually.” Can you explain further? Most of us, me included, just want to be comfortable and live a happy life. We try to avoid pain and suffering by surrounding ourselves with stuff. It's not a strategy that will work for long. Painful, difficult stuff happens to all of us and we have to find a way to live through it without our hearts being crushed forever. So the suffering forces us to look for a deeper reality; for a love that lasts 24 hours a day, seven days a week, 365 days a year. Lastly, what’s the significance of red in your life? I had a total nervous breakdown in 1971 in the temple with my guru. One of the ways he brought me out of it was that he began calling me Hanuman, Bajrangbali. He told me Hanumanji always wore red and I should wear red from now on. He made me dye everything I had red. Even my underwear!!! 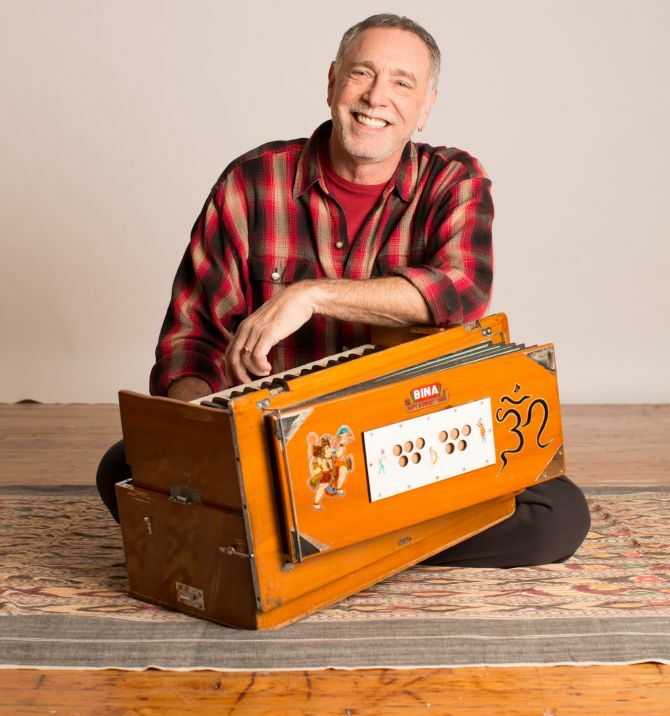 Krishna Das's kirtan concert is being held in Mumbai on January 16, in Bangalore on January 20 and in Delhi on January 23 and 24. Tickets and details are available online.